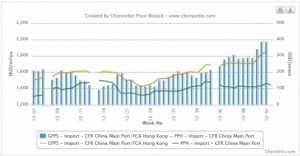 A strong GPPS market was one of the most striking features in China’s polymer market over the course of 2012, with developments in China reflecting a larger global trend, as per the pricing service of ChemOrbis. Pushed higher by persistent increases in styrene feedstock costs, GPPS prices gained significantly relative to HIPS and PP over the course of the year. Relatively better demand for GPPS relative to HIPS and greater volatility in HIPS feedstocks such as butadiene kept the gains in HIPS prices limited relative to GPPS. At the start of 2012, B-grade HIPS prices on an ex-warehouse China basis traded with a premium of around $170-220/ton over B-grade GPPS prices. HIPS prices gained relative to GPPS during the spring and the summer, with the premium for HIPS hitting a 2012 high of slightly more than $260/ton during June. However, the premium declined below the $200/ton threshold by mid-September and has been steadily losing ground ever since. During the months of November and December, the premium for B-grade HIPS over GPPS has never broken the $50/ton threshold and has sunk as low as $25/ton. 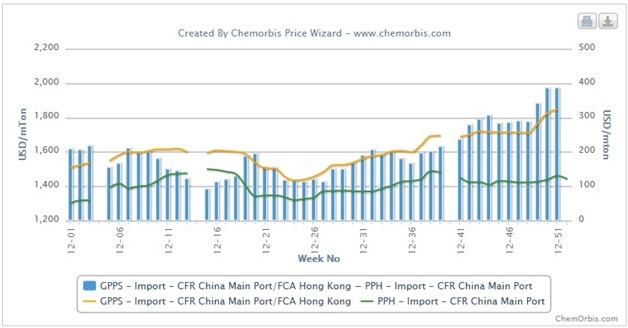 Import GPPS prices also enjoyed a strong year in China, with the premium for import GPPS on a CFR China/FCA Hong Kong, cash basis relative to homo-PP injection and raffia prices on a CFR China, cash basis witnessing large increases over the course of the year, as per ChemOrbis. GPPS prices opened the year with a premium of around $200/ton over homo-PP and the premium fluctuating between $100/ton and $200/ton during much of the first nine months of the year. GPPS prices began posting strong increases relative to homo-PP after the Chinese National Day holidays in early October, with the premium breaking the $300/ton threshold at the start of November and ending December close to the $400/ton threshold.